Zenith carburetor rebuild kit. This carburetor kits fits many Zenith carburetors used on Agriculture, industrial and marine applications. This is a new kit, currently being produced in the US. quick shipping,i have called mike 2 times and he has been very helpful,kit worked great and had all the parts i needed. Parts arrived quickly and worked perfectly. Nice kit, all the parts I needed were included. I would buy from this supplier again. Excellent kit, I rebuilt the carburetor for my 1949 Gibson Model D and it runs great now. Product was exactly what I needed. Excellent pricing and quick shipping. Thanks. The repair kit I purchased for my 1955 IH Cub Lo Boy with replacement Zenith carb installed included everything needed to make the tractor run like new.Mike's carbs got the order out fast with reasonable price on the kit and the shipping.Good People! Thanks for the prompt service, this was what I needed! Q: I just purchased this kit for my Gray Marine Engine, should I have purchased kit 6100 for the marine application instead? My carb does not have any model number but it is a zenith for a 1967 Gray Marine.sea scout 91. Q: Does this kit come with the float spring? Also where can I get the choke bracket? Q: I noticed that in the photo of the carb. kit, that the bowl gasket is similar, but has one more hole than my carb.has. I have already bought two kits that look just like yours,only eight dollars cheaper.Are you sure this is the correct kiy? Q: Bendix updraft carb on Wisconsin TJD 2 cylinder engine on old Model 20 Ditchwitch Will this kit work? A: To determine the correct carburetor kit we would need the carburetor number. That carburetor came with a small tag attached to the top of the carburetor which included the carburetor number. When that is gone, the only way to be sure of the correct kit is to take the carburetor apart and compare all of the parts with what we have in our photos. We can rarely look at the outside of a carburetor and determine the correct kit. Q: I have a 1971 Wisconsin TJD with a Bendix/Zenith 12288/L 63 L carb that has an adjustable main jet. Does this kit have the O-RINGS, etc. for the adjustment needle? Q: Need float hold down spring for: Wisconsin mod. THD, Spec #249332 . This engine has a Zenith 12158 carb on it. This engine is OEM power unit for a Case/Davis TF300 trenching machine. My guess is this spring keeps a steady downward pressure on the float because the machine jumps around while in use. Is this spring included it the carb kit you sell? I can send a picture of the spring if need be. Thank you. Q: Can I buy a load jet screw? Q: i have a Zenith on a Wisconsin engine AENLD the only number on the carb is ER-2-252 will a gasket in your kit fit on this? 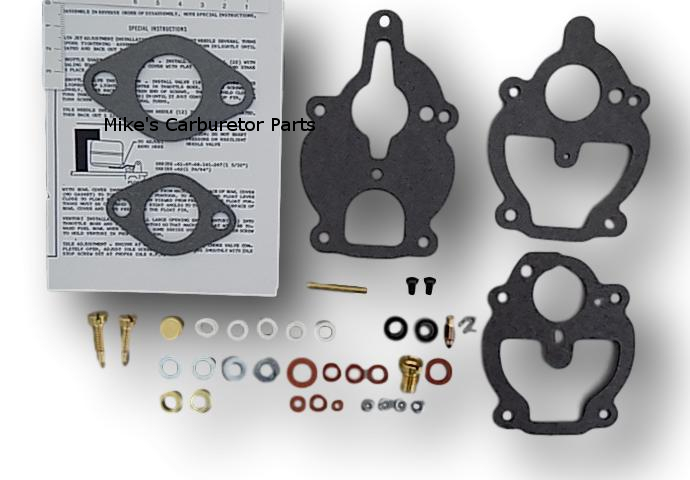 also do you get all three gaskets shown in this kit for the 25 dollars? A: Everything shown in the kit photo is included in the kit. Zenith carbs typically have a 5 digit number with a letter at the end, that is the one we need to confirm the kit. Otherwise you have to match your existing gaskets and parts to those in the kit photo. The needle & seat includes a clip which will help keep the needle from sticking. Clip the needle to the float. Just make sure it is clipped so that the needle moves straight up and down when the float moves. Don't put any pressure on the needle when adjusting the float. Any pressure will damage the viton tip.